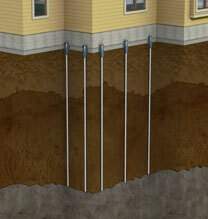 There are a number of ways that a structure can experience a settling foundation. The most common cause is due to the changes in the soils after construction of the structure has taken place. During drought conditions, the soil can dry and shrink causing settlement in structures. On the other hand, during periods of heavy rain, the saturation of soil can cause it to soften, resulting in the structure "sinking" into the ground. Also, a structure built on poorly compacted fill soil may settle due to the gradual compression of the fill soil. The Push Pier System from Foundation Supportworks will permanently stabilize the structure's foundation and provide an opportunity to lift the structure back to level without the expense and disruption of a full foundation replacement. Rugged steel tube sections are hydraulically driven through heavy-duty steel foundation brackets to reach depths of competent load-bearing strata. The weight of the structure is then carefully transferred from the original unstable soils, through the piers, to competent soils or bedrock, ensuring permanent stabilization and an opportunity to lift the structure back to level. 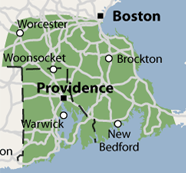 Contact us today for a free push pier estimate in Massachusetts and Rhode Island.